Microsoft Surface Hub UK – Surface Hub is the powerful team collaboration solution designed to advance the way people work together to engage, visualise and empower. Unlock the power of the group. With its expansive multi-touch screen, responsive inking experience on-board office apps, perfect for Office 365. 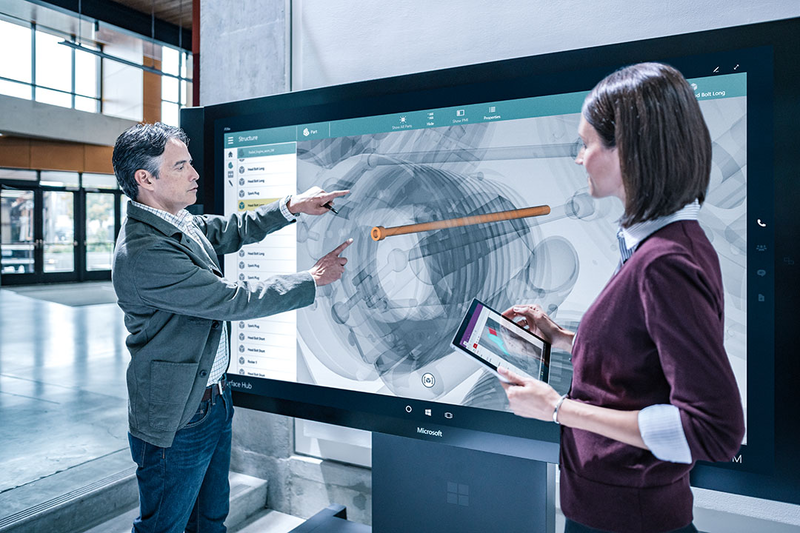 Microsoft Surface Hub advances the way people work together naturally in a digital world. Microsoft Surface Hub is an innovative interactive display technology that delivers an enhanced productivity experience for team meetings and agile working. Built to harness the power of Windows 10, Skype for Business, Office 365, OneNote and Universal Windows apps, the Surface Hub is a unique visual collaboration solution that will change the way people work. With its wide angle high definition cameras, infrared presence sensors and high performance microphones combined with an ultra-responsive, no lag multitouch HD screen, the Surface Hub is built for teamwork. The fully integrated design and choice of two screen sizes (55”/84”), means there’s a solution for your needs. Responsive digital inking helps teams create ideas, resolve problems and collaborate in real time with efficiency only dreamed about previously. 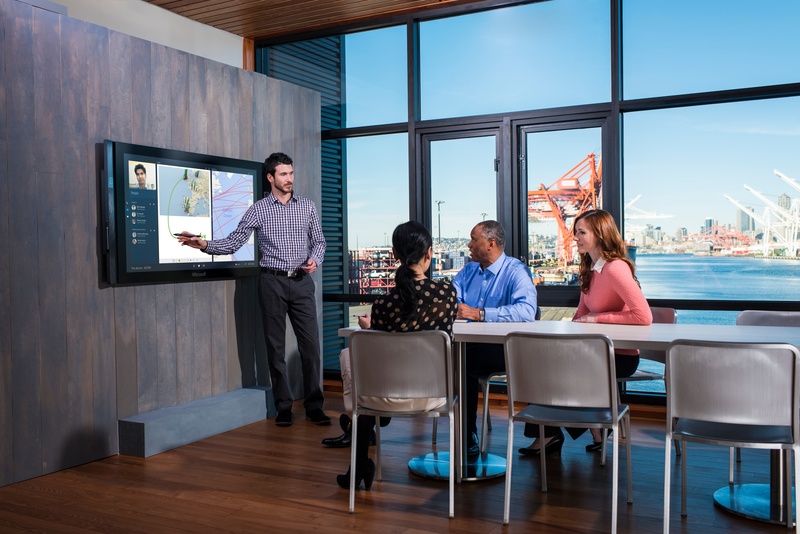 Surface Hub is perfect as the central part of any collaborative communications solution. Its feature-rich facilities are also perfect for enhanced video communications. The Microsoft Surface Hub is the catalyst in helping organisations and businesses revolutionise the meeting experience and unlock the power of group collaboration delivering strategic and agile business solutions. The device is designed around a highly responsive screen built for ink and touch, allowing users to share and interact with content effortlessly. The fully integrated design has a choice of two display sizes and includes flexible mounting and floor standing options – there’s a solution for any collaborative workspace. Generation Digital create tailor-made technology that helps you grow your business, become more productive and save money. Demo suites available in London, South and North. We offer attractive pricing on multiple units. Talk to our experts and we can show you how to take back control of your meeting space, whilst maximising your resources and gaining a quick ROI after adopting Digital prodcuts across your business spaces. Our experts can help you plan, install and integrate these along with all other leading Digital, Cloud and Audio Visual Technology. Make working together the most productive part of your day. Share your ideas with others on a canvas that is as big as your imagination. Bring teams together in a way that feels completely natural, with technology that doesn’t intrude, but helps ideas flow. Expand what can be accomplished in the moment and don’t lose the momentum capture your work so you can act on it later. Platform for amazing large-screen apps. In addition to the built-in team experiences like Skype for Business, Microsoft Office and Whiteboard, Microsoft Surface Hub is customisable with a wide array of applications. Universal apps built for Windows 10 shine on Microsoft Surface Hub and scale to the large screen. You can also connect apps from your personal device and drive them from Microsoft Surface Hub. The Surface Hub has been shown to help with information security. Meeting outputs can be saved to all participants at the swipe of a finger and are erased from the device once the meeting is over. Collaborate effectively using cloud based software applications that enhance team communication and participation, works perfectly Microsoft Surface Hub. With the cloud-based software, true collaboration that engages every team member is finally possible. Everyone – both in the room and working from a distance – can see all material and contribute in real time, meaning the whole group benefits from everyone’s perspectives. Users can develop deeper understanding of the material and arrive at new ideas faster. Because all work happens in the cloud, it’s always available. Users trade the impermanence of paper for the persistence of digital data. Canvases are always up to date and accessible. There’s no paper footprint, and in business, no need for costly travel or waiting to get team members in the same room. The world of work has changed dramatically over the last 10 years! Business can happen anywhere and at any time, hence there is a growing need for organisations to invest in tools that enhance productivity and increases business agility. Another consideration for meeting room technology is the trend towards collaborative working, the principle that people working together on projects and initiatives creating improved outcomes to siloed based activity. Microsoft Surface Hub is the perfect platform for amazing large-screen apps. Tailor your workflow with specialist apps or even create your own and share your ideas on a canvas as big as your imagination. In addition to built-in team experiences like Skype for Business, Microsoft Office and Whiteboard, Surface Hub is customisable with a wide array of specialist applications. Universal apps built for Windows 10 shine on Microsoft Surface Hub and scale seamlessly to the large screen. You can also connect to apps from your personal device and drive them from Surface Hub. The Microsoft Surface Hub is unlike any other meeting room solution. It’s a hardware platform providing a window to never-ending flexibility and customisation. From healthcare to design engineering, organisations can benefit from the emerging range of vertically focused apps or commission specific apps designed to work within their business. As organisations adapt their workflows to be more agile and collaborative, Surface Hub is designed to fit into these new environments. It provides people with the technology to generate big ideas, engage users near or remote and share content in real time. With an array of developers creating powerful, captivating apps, Surface Hub will always adapt to the next application running on it, making it the most flexible room-based hardware solution available. 100 Touch Points. Delivering Office apps directly inside the panel. Users gain direct access from the Windows 10 universal app range of software, including Office 365 that they are already familiar with - so no learning curve - just out of the box productivity and agile working! With a Windows 10 Operating System and built in WiFi, users are able to wirelessly access, manage and create content using familiar software packages. The ink on Microsoft Surface Hub is so fluid and responsive that it feels just like a pen on paper—and it lets two people ink at the same time. 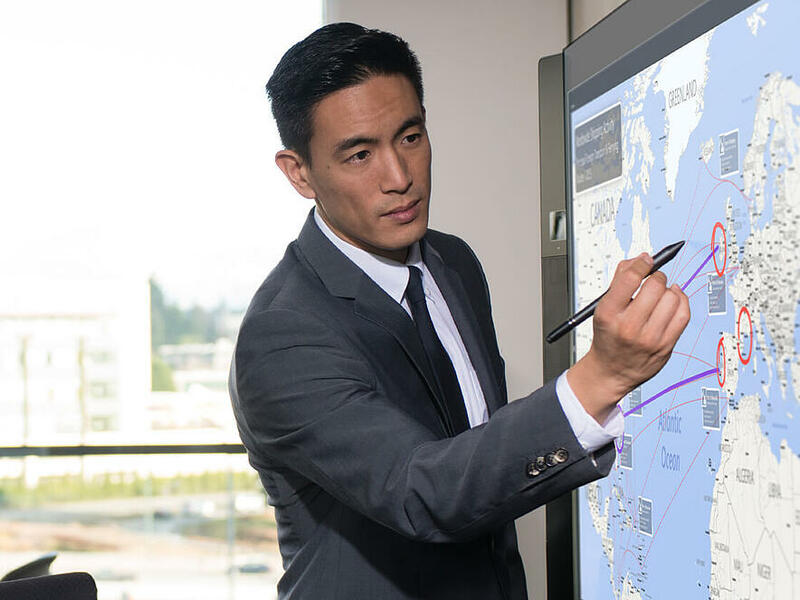 Whether you’re in the room or on the other side of the world, Microsoft Surface Hub brings everyone into the collaboration. Evoko Liso makes it easier than ever to book meeting rooms through your digital calendar or directly onto the screen using your fingertips. Book, end or extend a meeting directly from the screen or use the calendar to search for other available rooms based on size or equipment. Thanks to the green and red light aura you can see at a glance if the room is vacant or not, so no more confusion or double bookings. and organise so you can focus on what matters to you. Stay in the know, spot trends as they happen, and push your business further.